The Trophy Room is one of the North Wing additions you can build to expand your home from the Main Hall. 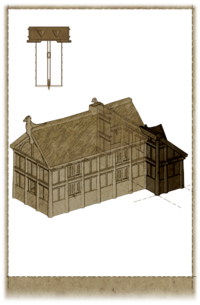 The following is a list of possible furniture items and decorations which can be added by using the carpenter's workbench in the Trophy Room. It is not necessary to purchase or build all furnishing options; you can pick and choose to better dictate style. However, all furnishing options are in a prearranged location and only ingredients and standard items can be moved. Oftentimes, the name of the furnishing option only indicates the primary piece of furniture, and actually includes various additional containers and accessories. A number of miscellaneous items are added with various furnishing options, but only notable items are specified on this table. This includes usable containers, and rare ingredients or items. Though they are added to your home, other items and ingredients are not listed here. Barrels Sawn Log, Nails, Iron Ingot One barrel and one sack on north wall, west side. Three sacks on north wall, east side. Chest Sawn Log, Nails, Iron Fittings, 2 Hinge, Lock South wall, east of door. Cupboard 2 Sawn Log, 4 Nails, Iron Fittings West wall, south side. Adds one strong box. Cupboard 2 Sawn Log, 4 Nails, Iron Fittings West wall, north side. Adds one strong box. Cupboard 2 Sawn Log, 4 Nails, Iron Fittings East wall, north side. Adds one strong box. Night Table Sawn Log, 2 Nails South wall, west of door. Display Case and Shelf 2 Sawn Log, 4 Nails, Hinge, Glass South wall, west side. Adds one knapsack. Tall Shelf 2 Sawn Log, 4 Nails South wall, east side. Adds one satchel and one giant's toe. Wall Shelves (2) Sawn Log, Nails One on north wall, east side. One on south wall, east of door. Wall Shelves (2) Sawn Log, Nails One on north wall, west side. One on south wall, west of door. Chandelier, Small Iron Ingot, 3 Goat Horns, Iron Fittings Center. Mounted Goat Head Leather Strips, Goat Hide South wall, west of door. Mounted Horker Head Leather Strips, 2 Horker Tusk South wall, east of door. Trophy Base, Large Quarried Stone, Sawn Log, 2 Clay East wall, center. Trophy Base, Large Quarried Stone, Sawn Log, 2 Clay North wall, center. Trophy Base, Large Quarried Stone, Sawn Log, 2 Clay West wall, center. Trophy Base, Small Quarried Stone, Sawn Log, Clay South wall, west side. Trophy Base, Small Quarried Stone, Sawn Log, Clay North wall, east side. Trophy Base, Small Quarried Stone, Sawn Log, Clay South wall, east side. Trophy Base, Small Quarried Stone, Sawn Log, Clay North wall, west side. Wall Sconces (2) Iron Fittings, Goat Horns South wall, on west and east wall supports. Sometimes when building a trophy it will appear on a different base, even one that it would not normally be able to be built on.